Optimus Prime, large and in charge, supervising Dara James production. He selected a grey, pleated, single bib stock tie to match his sterling, poodle-hair coat. 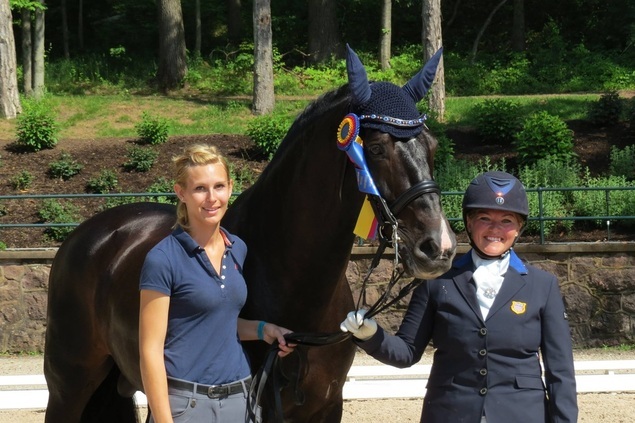 Susan Treabass with her groom Dana and horse Kam at Gladstone qualifying to represent the United States in Normandy at the 2015 World Equestrian Games. Wearing an ice blue satin traditional Dara James stock tie. U.S. Para Dressage team competing at the World Equestrian Games wearing Dara James stock ties to match their horses' browbands. Cindy Cavell wearing her new Dara James bow tie. Jane Cleveland sporting a pink Dara James stock tie at the Spirit Equestrian Breast Cancer Awareness Show in Somis, CA, October, 2014; riding Monique. Reno young rider Cyd Curle off to the show with her Dara James collection.